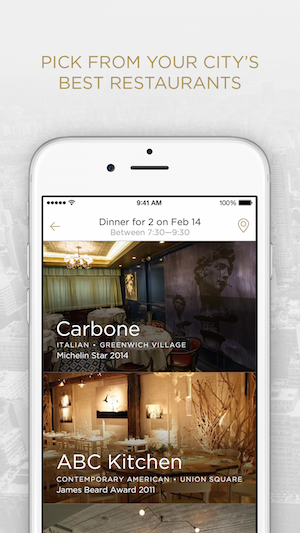 A startup called Reserve is launching a beta version of its “digital concierge” app today, promising to help users snag reservations at top-tier restaurants and improve the dining experience overall. With other online reservation tools, most notably OpenTable, users have to find the restaurant they’re looking for and then see if the time they want is available. The Reserve experience is a bit different. After all, if you’re going on a big date, or if you want to take a friend or family member somewhere fancy, you might have a specific restaurant in mind, but there’s also a good chance that you just want to get a reservation at a decent spot in a certain neighborhood and period of time. And that’s how Reserve works — users just identify the date and time window that they’re looking for, and the app will provide them with a list of recommended restaurants. After you peruse the listings (which include online menus and information like awards won), you choose the restaurant or restaurants that interest you, and Reserve will try to get a reservation. Co-founder and CEO Greg Hong said the app goes beyond the reservation itself. The startup has built a relationship with each of the listed restaurants, so once you get there, the staff knows they should be “treating you like a regular.” And the app already has your credit card (as well as a preset tip percentage) on file, so it handles the payment for you — you don’t need to flag down a waiter at the end of the meal. I tested the app out myself early yesterday evening. In part, I was curious whether it could really get me a reservation at a Michelin Star restaurant that very night. (If you’re into that kind of thing, a number of the restaurants listed in the app had Michelin Stars.) Well, it didn’t quite succeed — a few minutes after I requested my reservation, I got a text telling me that my choice was booked up for the night, but it offered another reservation in my time window at a restaurant nearby. To be honest, I was relieved, since I wasn’t really planning on a fancy dinner. The app kept texting me with new possibilities, which would probably have been welcome if I was actually searching for a last-minute reservation. But at a certain point I had to text back “Cancel” so that the messages would stop. He also noted that Reserve is doing something unusual behind the scenes, because it isn’t charging restaurants a fee. Hong argued that those fees can “really cut into [restaurants’] profit margins,” so instead, Reserve charges diners $5 per reservation. The service is currently available in New York, Los Angeles, and Boston, with plans to launch in more markets soon. To help with the Boston launch, the company acquired the team behind reservation service SpoonSpoon. Update: You can download the iOS app here. And here’s a demo video.